All around the World people are making final preparations for World Youth Day in July, my thoughts wandered back to its beginnings. He entrusted the youth with the World Youth Day Cross, and placed his trust in the young people of the world to carry forth the lasting values of the Church. In reading the life of Blessed John Paul, we find in him a vibrant young person full of zest for life. But if we look closely, we have to ask ourselves, Where did he get this zeal? We might also say, What a pity more Christians are not like him! Oh, but we are meant to be like saintly John Paul! We may not become pope, but we are called to be filled with the same spirit and zeal for Christ. It is the path to holiness. But how? How in our modern world where there are so many obstacles that bombard our daily life are we to carve a life of holiness? There is no magical solution. We cannot expect a vision or event to heighten our spiritual senses so to be thrust into a life of prayer overnight (that’s not to say that God doesn’t intervene in special ways from time to time, but I am not counting that as the norm). We need to make a move toward God. 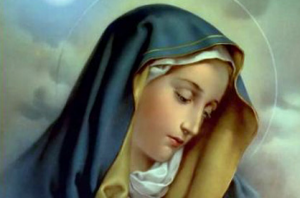 As a young man, Karol Wojtyla read Saint Louis de Montfort’s book, True Devotion to Mary, and he credits the book for how his life took a decisive direction. His Papal moto “Totus Tuus” comes directly from de Montfort’s shorter prayer of consecration. His holiness did not happen overnight; but it began by a decisive turning to God. Can we not do the same? Why not make these simple words ours? Why not make all that we are, a prayer to be “totally yours” to God through Mary? What would our world be like if all of us followed Blessed John Paul’s example and became “Totus Tuus”? (I belong entirely to you, and all that I have is yours. I often hear from young Catholics how they find it so hard to set aside consistent times of prayer, Mass, devotions, reading the Bible. Even Karol Wojtyla had to pick up that book by de Montfort and read in order to meet his life-changing event. We have to be willing to dedicate a time – a window – through which God can begin to work in us. And if we do, the Holy Spirit will meet us and guide us the rest of the way. One very useful book that I came across: 33 Days to Morning Glory: A Do-It-Yourself Retreat In Preparation for Marian Consecration by Fr. Michael E. Gaitley, MIC. I had made my Marian Consecration in 2004, but felt a desire to re-consecrate myself and found this book very helpful. It takes the teachings of Saint Louis de Montfort and breaks them down, using four Saints – de Montfort, Maximilian Kolbe, Blessed Teresa of Calcutta, and Blessed John Paul II – to lead us through understanding Marian consecration. Many parishes have used this book to bring more of their members to ‘give themselves to Christ through Mary. In fact, our parish has a small group preparing for their consecration on July 16 (Feast of Our Lady of Mt Carmel). The book is rich in insight, and yet not time-consuming. The book is enjoyable. The daily reflections short. It leads little by little to a deeper appreciation of Mary’s role, and how she is there waiting to make us other Christ’s, all for God and His Divine Glory. Blessed John Paul led a life with giving all to Mary (Totus Tuus). What would happen if one after another resounded these words ‘Totus Tuus’ again…and again!